Traveling through the extensive highlands of Chiapas, one experiences an environment radically different from the steaming lowlands. Here, at over six thousand feet, pine forests and pleasant temperatures are encountered. Daytime highs are generally in the 70s or 80s. Highland Chiapas and adjacent Guatemala are the heart of the Mayan empire and many of the butterflies found here are endemic to this region. The scenery is beautiful and the cities, especially San Cristobal de las Casas, are fascinating. Although the abundance and diversity of butterflies is always dependent upon changing environmental conditions, we hope to see more than 400 species on this trip. Day 1. Thursday The tour begins this evening at the Tuxtla Gutierrez airport. Night at a comfortable hotel in Tuxtla Gutierrez. Day 2. Friday. Today we will visit fabled Sumidero Canyon, one of the most spectacular canyons in the world. We will travel alongside the canyon, to the miradores, or lookouts, where the views are unending. Butterflies we have seen here include large and resplendent Regal Greatstreaks (Evenus regalis), simple, but elegant, Simple Patches (Chlosyne hippodrome), Big-spotted (Anaea perenna) and Black-veined Leafwings (Consul excellens), Turquoise Emperors (Doxocopa laurentia), Little Ur-Satyrs (Taygetis kerea), Blue-collared Firetips (Mysoria amra) and the elusive Mexican Enskipper (Entheus crux). We will search for Archaic Swallowtails (Baronia brevicauda), highly unusual primitive swallowtails that don’t look like swallowtails. Night at a comfortable hotel in Tuxtla Gutierrez. Day 3. Saturday. This morning we will explore a forested area near Tuxtla Gutierrez. Some of the hundreds of species found here include Chiapas White (Perrhybris pamela), Paula's Oleria (Oleria paula), Fuzzy-spotted Ticlear (Hypoleria lavinia), Clearwing Mimic-Queen (Lycorea ilione) and Chiapas Giant-Skipper (Stallingsia jacki). In the afternoon we will drive to San Cristobal de las Casas. Night at a comfortable hotel in San Cristobal. Day 4. Sunday. This morning we will visit cloud forest in the vicinity of San Cristobal. This is one of the few areas known where Guatemalan Coppers (Iophanus pyrrhias) can be found, and we have been fortunate enough to see them here. 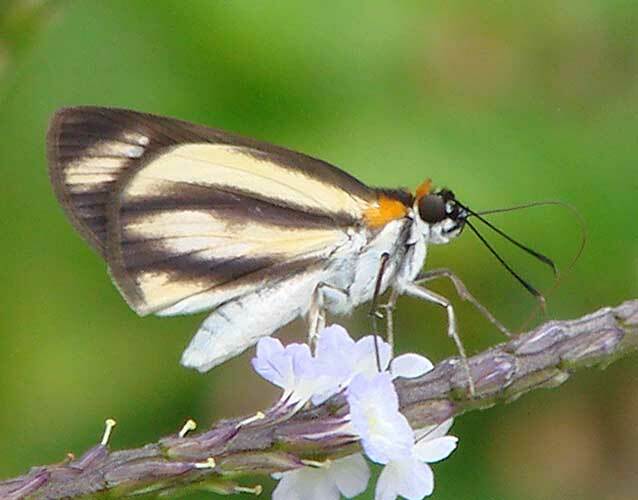 In addition, we will look for Black-pointed Tile-Whites (Hesperocharis graphites), Chiapas Hairstreaks (Callophrys scaphia), Tailed Sisters (Adelpha creton) and Cloud-forest Zesty-Skippers (Zestusa staudingeri). Perhaps we'll be lucky and see a Mayan Skipperling (Dalles freemani). On a previous trip we found and photographed the only individuals of this species other than the type specimen. Among the interesting birds here, we have seen Blue-throated Motmots and Blue-and-white Mockingbirds. We may spend the day in this area or, depending upon how we are doing, we may butterfly nearby pine forest habitats containing species such as Pine Crescents, Guatemalan Pedalios (Pedaliodes napaea), and Cloud-forest Poans (Poanes niveolimbus). Night in San Cristobal de las Casas. Day 5. Monday. Depending upon our activities yesterday, this morning we will either butterfly nearby pine forest habitats or drive south to the city of Comitan, butterflying along the way. In the past, we have seen species such as Chocolate Skipperling (Piruna brunnea) and Blue Mellana (Quasimellana myron) along this route. Depending upon the time of our arrival, we may visit a nearby archaeological site where we have found butterflies such as Navy Eighty-eights (Diaethria astala). The hotel we will be staying at provides an exceptional experience – antique furniture, rugs and paintings in a tranquil mountain setting. Eastern Bluebirds, which nest on the grounds, mingle with Black Crescents. Night near Comitan. Day 6. Tuesday. This morning we will drive the short distance to Lagunas de Montebello, a national park on the Guatemalan border. Known from the area are Yellow Kite-Swallowtail (Eurytides calliste), Bar-celled Oleria (Oleria zea), Pithy Sister (Adelpha pithys), Montane Sister (Adelpha donysa), Starred Oxeo (Oxeoschistus tauropolis), Orange-bordered Satyr (Pseudomaniola gigas), Wide-bordered Satyr (Satyrotaygetis satyrina), Geyer’s Dircenna (Dircenna jemina), Dark-fringed Banded-Skipper (Autochton vectilucis), Cloud-forest Fantastic Skipper (Vettius conka), Violet-washed Skipper (Damas clavus), and Chiapas Sedge-Skippers (Euphyes chamuli) among many, many others. This area has one of the longest lists of butterfly species of any spot in Mexico. We will hope for stunners such as Pale-tipped Cycadian (Theorema eumenia), Bates’ Greatstreak (Evenus batesi), Jet Blackstreak (Ocaria thales), Green-spotted Brangas (Brangas carthaea), Gaudy Eyemark (Mesosemia gaudiolum), Bar-coded Jewelmark (Sarota gamelia), Blue-and-orange Banner (Epiphile iblis), and Chiapas Firetip (Pyrrhopyge tzotzili). This may be your last chance to see this area, because it is being rapidly cut. The remnant cloud-forest patches that remain harbor many special butterflies and birds -- Quetzals and Black-throated Jays hang on -- but I doubt that anything will be left within five to ten years. Night near Comitan. Day 7. Wednesday. This morning we will drive to the Monte Azules reserve near Chajul, in the Chiapas lowlands. This area, with probably the most extensive tropical rain forest remaining in Mexico, is the northern limit for a huge number of truly tropical butterfly species. With many hundreds of species occurring here, it is hard to know which to pick out for special mention! Standouts that have been found here include Green-celled Cattleheart (Parides childrenae), Stripe-tipped Fiestamark (Symmachia rubina), bright orange with bold black-and-white wingtips; Imperial Sunstreak (Arcas imperialis), a shimmering iridescent green underside conceals the brilliant iridescent blue topside of the namesake of Sunstreak Tours; Common Olivewing (Nessaea aglaura), cool olive on the outside, it is striped with brilliant turquoise on the inside; Brilliant Greenmark (Caria mantinea ), with brilliant iridescent green patches; Graphic Beauty (Baeotus baeotus), an artist’s delight with an amazing black-and-white pattern punctuated by orange spots; and Great Agrias (Agrias aedon), Monarch-sized with brilliant iridescent purple and large red patches above. With any luck, we shoul have great views of some of the few remaining Scarlet Macaws in Mexico. We will spend nights at an adequate lodge near Chajul. Day 8. Thursday. We will spend the entire day exploring the tropical rain forest. Night near Chajul. Day 9. Friday. Depending upon the butterflies, we will either spend this morning in the vicinity of Chajul or we will drive back to Lagunas de Montebello for another chance at its butterflies. A mid-afternoon drive will bring us back to the our hotel near Comitan. Night near Comitan. Day. 10. Saturday. Today is mainly a travel day as we begin the day near Comitan and end the day in Tapachula, near the Pacific coast. We hope to have time in the afternoon to butterfly the forested road north of Huixtla. Night in a comfortable hotel in Tapachula. Day 11. Sunday. Butterflying northeast out of Tapachula we will be in magnificent forested slopes. For many species, this is the best area in Mexico to find them. We hope to encounter spectacular Blue-and-yellow Beautymarks (Ancyluris inca), Weak-banded Crescents (Phyciodes drymaea), Doubleday's Acinotes, (Actinote anteas), Cloud-forest Beauties (Pycina zampa), to-die-for black-and-red-and-pink-and-yellow Two-eyed Eighty-eights (Callicore pitheas), Cloud-forest Gemmed-Satyr (Cyllopsis steinhausorum), Rusty Ticlears (Olyras theon), Common Ghost-Skippers (Phanus marshallii), Nervous Skippers (Udranomia kikkawai), and rarely seen Banded Zesty-Skippers (Zestusa levona). We may not see all, or even most, of these, but we will see a lot of butterflies! Night in Tapachula. Day 12. Monday. This morning we will again butterfly the rain forest near Tapachula. In the afternoon we will head northwest along the coast, butterflying as we do. Night in Mapastepec. Day 13. Tuesday. Today we will drive north from Mapastepec into the luxurious forest near El Triunfo hoping for a raft of new butterflies, such as Pale Actinote (Actinote lapitha), Barnes' Sister (Adelpha barnesi), Blind Purplewing (Eunica mygdonia), and Guatemalan Emperor (Doxocopa callianira). In the late afternoon we will drive northwest to Arriaga. Night in Arriaga. Day 14. Wednesday. This morning we will butterfly the relatively dry hillsides around Arriaga, a very different habitat than the ones we have visited so far. In addition to new butterfly species, such as Black Patches (Chlosyne melanarge) and Holey Leafwings (Zaretis ellops), endemic birds such as the gorgeous Rosita's Bunting might make an appearance and, if we glance their way, whose to know? In the afternoon we will complete our circle by driving back to Tuxtla Gutierrez. Night in Tuxtla Gutierrez. Day 15. Thursday. The trip ends this morning at the Tuxtla Gutierrez airport. Leader will be Jeffrey Glassberg, president of the North American Butterfly Association and author of Butterflies through Binoculars and ofA Swift Guide to the Butterflies of Mexico & Central America. Cost of the main trip is $4490/person from Tuxtla Gutierrez. Cost includes double-based accommodations, meals (except, because of staggered arrival times, dinner the first night), ground transportation, airport transfers, tour leader fees and entrance fees. Not included are alcoholic beverages, laundry services, and other items of a personal nature. Single supplement is $575. This trip is limited to 8 participants. we're likely to see a few butterflies!